Bedřich Friedrich Smetana (March 2, 1824 - May 12, 1884) was Born in Litomyšl, Bohemia (now the Czech Republic). 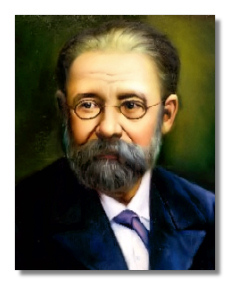 He is one of the first of the great 19th-century "nationalist" composers; Smetana gave his beloved Bohemia a central role in his two most famous works, the orchestral suite Má Vlast and the opera The Bartered Bride. Utterly devoid of bombast or jingoism, these allusions only serve to deepen a listener's appreciation of Smetana's music. Smetana's creative career was up with the struggles of his native Bohemia to assert its basic right to exist. He was born into the family of an amateur musician and brewer on the Litomyšl estate of Count Waldstein and by the age of five was playing violin in a performance of a Haydn quartet. The following year, 1830, he made his debut as a pianist, playing the overture to Daniel-François Auber's La muette de Portici (The mute girl of Portici); aged eight he was happily composing folk and dance tunes. Yet his parents had neither the foresight nor the discipline to enforce his formal musical training, and while he had plenty of ambition – writing in his diary in 1840 that he wanted to become "a Mozart in composition and a Liszt in technique" – he went on to complete a general education only at a school in Pilsen. Pilsen played an important part in Smetana's life, for here he was reacquainted with Katerina Kolar with whom he used to play piano duets in his boyhood. The 19-year-old Smetana fell hopelessly in love with her and she repaid him in a way which earned her his lifetime gratitude: at this time she was studying piano in Prague with the venerable teacher Josef Proksch, and through persistence and charm she persuaded Proksch to accept the impoverished Smetana as a student in composition and theory, allowing him to defer payment until he could afford it. This brought Smetana to Prague with at least some prospects. The connections which opened up led to the Director of Prague Conservatoire recommending Smetana to the family of Count Leopold Thun as their resident music master and piano tutor. Thus the newly employed Smetana combined extended stays in the country with the family during the summer with periods in town attending the Prague social "season". In the succeeding years Smetana gradually shifted his ambition from being a virtuoso in the Lisztian manner to being a composer with a strong personality of his own. Even early piano pieces, such as Bagatelles and Impromptus (1844) had a charm and simple sincerity which contained his unmistakable stamp. They also reflected the trials and tribulations of his on-off affair with Katerina Kolar. In the build up to the turbulence of the 1848 revolutions in Europe, Smetana began to feel the limitations of his service in the Thun household; by 1847 he had decided to start his own music school in Prague. One of those he applied to for financial help was Franz Liszt who saw the worth of some piano compositions Smetana had sent him and wrote encouragingly to the young Bohemian, even offering to find him a publisher for his music. Suitably enthused, and with the outbreak of the 1848 insurrections (to which he felt passionately committed), Smetana left the employ of the Thun family. Careful not to burn his bridges, he arranged for Katerina to succeed him as Thun's music master. The music school opened in 1848, and in the following year Smetana and Katerina were married. However, the Smetanas found themselves constantly on the edge of financial precipices as they struggled to make the music school pay its way, and a series of childbirths resulted in only one infant, Zofie, surviving past early childhood. Although Smetana was widening his circle of musical friendships – meeting Clara and Robert Schumann and keeping in touch with Hector Berlioz, whom he had met in 1847 – Prague refused to be conquered by his achievements. In 1855 his beloved Katerina began to show signs of consumption, and when Smetana accepted an offer from the Göteborgs Harmoniska Sällskap in Sweden to become their conductor, it enabled the Smetanas to escape Prague's vicious political intrigues. Smetana remained in Sweden until 1861, developing his approach to orchestral composition, taking as his models the Lisztian and Wagnerian ideals of programmatic music, where a work is given its unity by thematic and motific means and by the subject matter itself. Curiously, his absence from Prague did not bring on a wave of creative nostalgia, and the works composed while in Sweden, including Wallenstein's Camp and Richard III (he was a fervent admirer of Shakespeare's plays) show him reacting to more cosmopolitan stimuli. In 1857 Katerina died, her illness hastened by the harshness of the Scandinavian winters. Smetana proved unable to cope with the loneliness, turning in his grief to Bettina Ferdinandova, the sister-in-law of his brother, Karl, marrying her a year after Katerina's death. In 1861 Smetana and Bettina returned to Prague. Within a year of his arrival, the Provisional Theatre, dedicated to Czech language plays and operas, was opened, and Smetana became a leading light in the battle to establish it on a firm footing. This was achieved despite considerable opposition from the conservative elements within Prague's cultural society, who did not appreciate an ardent supporter of Wagner and Liszt, those arch-modernists, leading the way in Prague. It was at this time that Smetana's thoughts turned to creating musical dramas and orchestral pieces which celebrated the popular culture and history of the Czech people. By 1863 he had completed his first opera, The Brandenburgers in Bohemia. This patriotic work which deals with Bohemia's political history and a wholesale uprising, proved initially very popular and its warm reception inspired Smetana to look for a production of his already completed subsequent work. The Bartered Bride, as it came to be known, was produced at the Provisional Theatre. Smetana was now the Theatre's conductor, and all looked set for success. However, the Austro-Prussian War intervened, and although the Bride had a happy premiere, it was only after military maneuvers were over that a less unnerved public took The Bartered Bride to its collective heart. The opera became such a runaway success that its position as the most popular Czech opera has remained unchallenged ever since, despite the later triumphs of Janácek. The Bride was blessed with a strong, simple plot, a first-rate libretto, well-conceived characters and music which was endlessly charming – in short, its poise and balance were truly Mozartian. Smetana spent the rest of his life as an operatic composer trying to recreate this level of popular acclaim. A combination of public expectation and Smetana's increasing inclination to take a more progressive musical stance led to his next opera, Dalibor, being coolly received. This is not to assume that the work itself, a stern assessment of a key figure in Czech history, is poor; it is a fine piece, and is often performed in its homeland today, but Smetana had outdistanced his public. Undaunted, he chose an equally ambitious subject for his next opera, Libuše which more closely reflected Bohemian political and national aspirations, combining legend and moral lessons in a sober prophecy of the eventual triumph of the Czech people. Smetana himself realized the 'occasional' nature of this opera, declaring it fit to be presented only "during festivals which touch the whole Czech nation". For this reason if none other he waited until the grand opening of the new National Theatre in Prague in 1881 for it to be premiered, more than eight years after its completion. The operas which appeared between Dalibor and Libuše show the diversity of subject and mood, as well as sureness of touch, of the now fully mature and confident composer. The Two Widows (1874) was a comedy with French origins which is unfailingly light in mood and technique, while The Kiss (1876) and The Secret (1878) were both inspired by stories set in the Bohemian countryside. Not content with celebrating his country's beauty and importance in opera, Smetana also took the earlier lessons he had learned from Liszt, Berlioz and Wagner with regard to extended orchestral works and turned them to bear on various aspects of Bohemia. In 1874, Smetana began work on the cycle of symphonic poems which would eventually form the six-part Má Vlast (My Country). At the same time the first signs of the physical disintegration which would kill him manifested themselves, and Smetana realized he was going deaf. Má Vlast is made up of individual movements, some of which have become world-famous in their own right. Certainly the second one, Vltava (The Moldau) is often played as a distinct entity, its wonderful storyline brought to life by the composer's deft melodic and rhythmic invention. The other exceptionally popular section is From Bohemia's Woods and Fields, and this glorious musical depiction of the Bohemian countryside has a magic all its own. Smetana completed Má Vlast in 1878-9, although the complete cycle was not performed until 1882. By then Smetana was aware that his deafness precluded any thought of him conducting the premiere. He had withdrawn from public life as his infirmities – caused it seems by hereditary syphilis – increasingly incapacitated him and his conservative enemies in Prague continued their attempts to undermine his position. Smetana completed one further opera, The Devil's Wall, which he described as "comic-romantic" and which, despite a plot which lacks the usual lucidity of Smetana's other operas, has held its place on Czech stages. Smetana wrote it in the face of the most terrible physical and mental sufferings, all symptoms of the impending collapse. Despite his known condition and his courage in completing the work and its general public approval, its premiere was marred by heartless criticism from his enemies. A testament to his unending courage was the fact that Smetana embarked upon writing the opera Viola in 1883, based on Shakespeare's Twelfth Night, and in fact managed to complete a whole act before his final mental collapse in April 1884, just weeks after a Prague concert held in his honor. In mid-May he died. Smetana's happy disposition and endlessly brave optimism in the face of the most terrible private pain, as well as his unquenchable faith in the future of his nation, has given his music a unique place in Czech life, placing it apart from the humourlessness and gloom of much of the so-called serious music of his century.